“We were ordered to proceed to Liverpool and get on a ship and go wherever it took us.” Harry Marlow, then a private in the Army Air Corps, remembers to this day the hasty departure of the 49th Fighter Squadron from Atcham Field in 1942. Harry’s unit was among the many American and British troops who left England on a November day to a destination unknown to them. Only when they entered the Strait of Gibraltar, remarks Harry, did the men realize they must be headed for the coast of North Africa. Even then they did not know where they would land or what to expect. Private Harry A. Marlow of Bell, California, at Hamilton Field. (Photo from Harry Marlow). The 49th Fighter Squadron activated in Hamilton Field, California, was part of the Army Air Corps 14th Fighter Group. 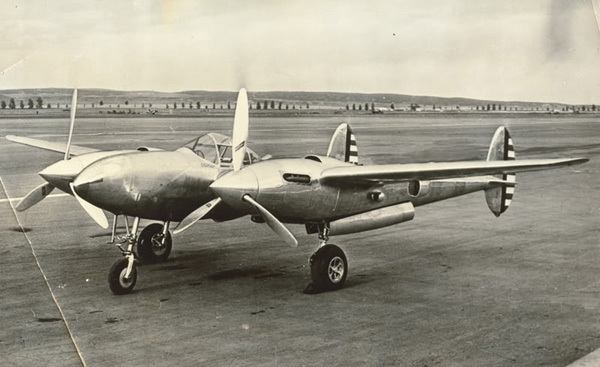 Harry Marlow was among the men of the 49th who arrived in England on August 18, 1942, to train with their new Lockheed P-38 Lightnings, a swift lightweight twin-engine fighter. Like most of the other Americans at Atcham, this was Harry’s first time in a foreign country. A history enthusiast, he took every opportunity to explore and photograph the area around Shrewsbury, especially the ruins at Viroconium, the fourth largest city in Roman Britain. Unable to fly because of his eyesight, Harry had an aptitude for work with codes and ciphers and underwent intensive training in Ipswich. Since all military communications were always sent in code, never in text, he was constantly busy encoding or decoding incoming and outgoing messages. He also mapped the positions of aerial barrage balloons, huge balloons anchored to metal cables, which protected the area from German planes but at the same time constituted a hazard for the American pilots training at Atcham. 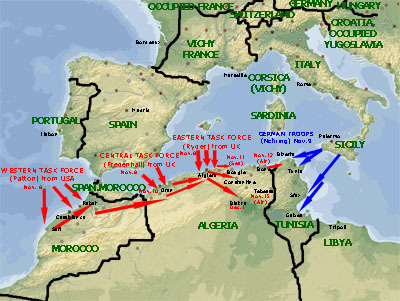 In November, 1942, American and British commanders put into motion their plan for landing troops in Morocco and Algeria, then under the control of the Vichy French government. In spite of efforts to assess and mobilize the sympathies of the French in the area, the response of the French forces to an Allied invasion of North Africa was uncertain. Allied ships were deployed to Casablanca, Oran, and Algiers in a series of landings known as Operation Torch. The goal was to open a second front in Europe, drive the Axis out of the area, and provide a base for an invasion of southern Europe. As a part of this strategy, the men of the 49th Fighter Squadron landed in Oran on November 8, 1942, marched to the nearest airfield, and were taken to the Maison Blanche (now Houari Boumediene) Airport in Algiers by train. They were housed in a compound belonging to the French governor-general. 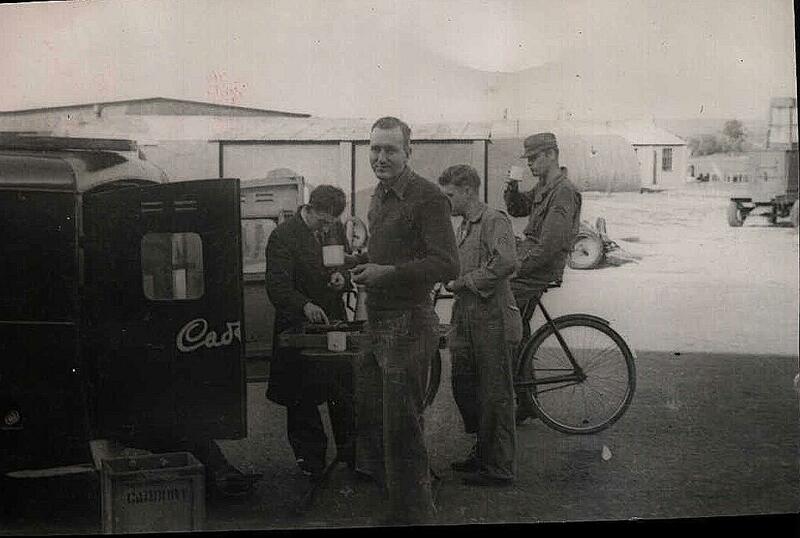 On December 15, 1942, Harry and most of his squadron left the mess hall after dinner, seconds before it was shattered by bombs. They turned back to help their injured comrades and carry them to the medical station, where someone noticed that Harry too was bleeding from a shrapnel wound. After that, he says, bombing raids were constant and unpredictable. 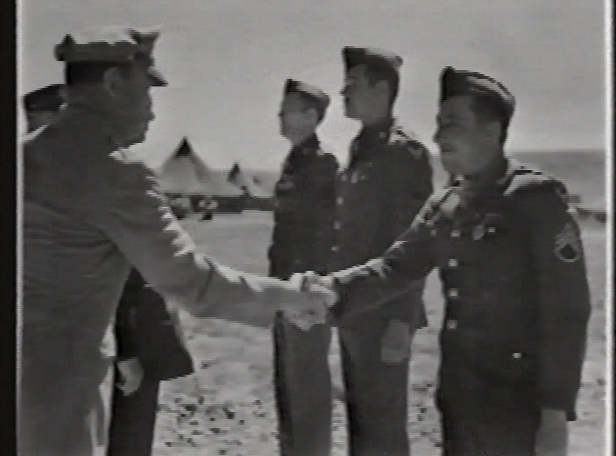 Harry (middle) receives the Purple Heart in Algeria, 1942. (Photo from Harry Marlow). 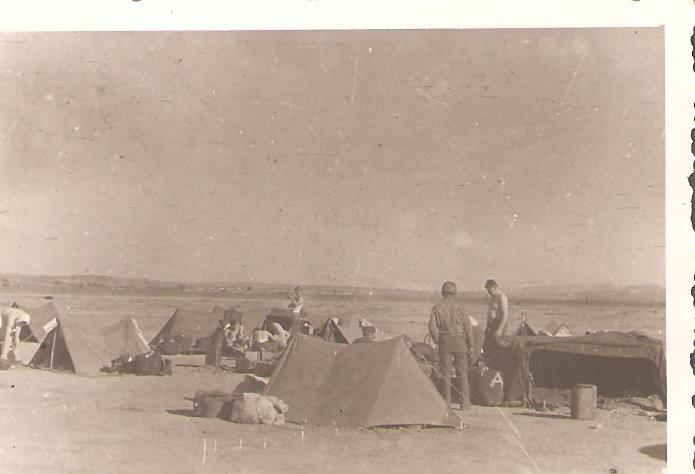 The men of the 49th continued to see action as they moved to Tebessa near the Tunesian border, joining the forward echelon of the advance to Tunis, the last base of the Axis powers in North Africa. 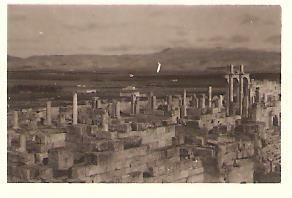 Fascinated by the rich history of this region, Harry saw as much as he could of the Roman and early Christian sites around Tebessa, even as Rommel’s tanks headed for the Kasserine Pass. In October, 2001, Harry and I walked around Atcham Field, accompanied by Toby Neal, a reporter from the Shropshire Star. 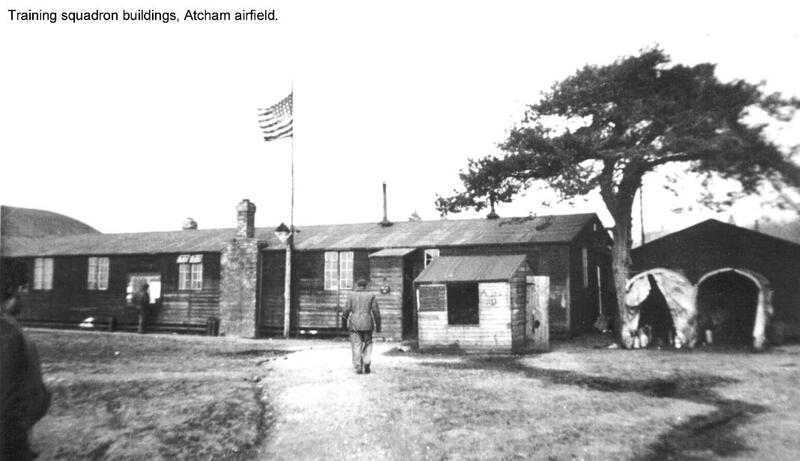 The wartime buildings of Atcham were being torn down that very month. Toby published an article about the 83-year-old American who had returned to see the airfield he remembered so well. One of Harry’s regrets was that the departure for Liverpool in 1942 was so precipitate that he was unable to pick up the last few rolls of film he had left at the developer’s in Atcham. 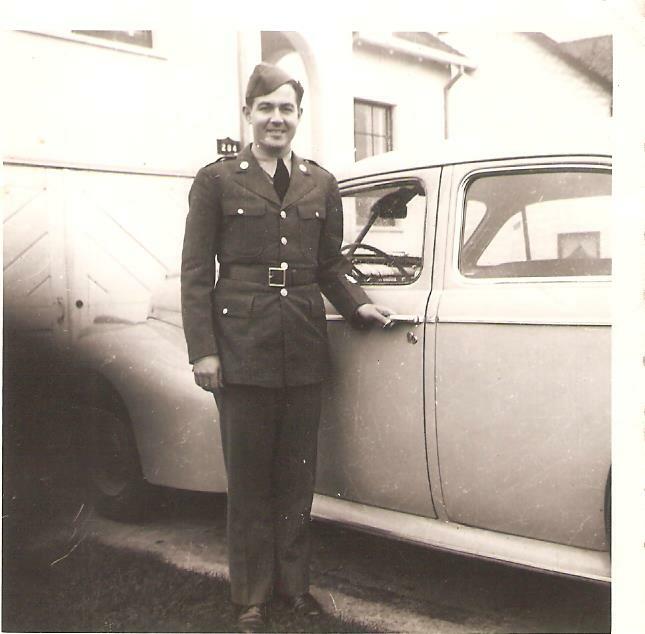 Better than pictures, though, are Harry’s vivid memories, still sharp at the age of 97. Harry, 83, surveys the rubble of the Atcham Airfield buildings in 2001.
http://www.nationalww2museum.org/see-hear/collections/focus-on/kasserine-pass.html?referrer=https://www.google.com/ The National WWII History Museum, New Orleans. Includes a first-hand oral history of the battle at Kasserine Pass by Dominic Martello. Special thanks to the Oral History: Veteran’s Project of the Library of Congress of the United States in partnership with the Historical Society of Leisure World, Laguna Woods, California, for recording my father’s memories back in 2003 and for giving me a copy of that interview. Happy Veterans Day! I miss you, Grandpa!